'I make a call for calm,' the city's mayor said. Police clashed on Saturday with Catalan separatists in downtown Barcelona who had gathered to protest another march by Spanish police demanding better pay. 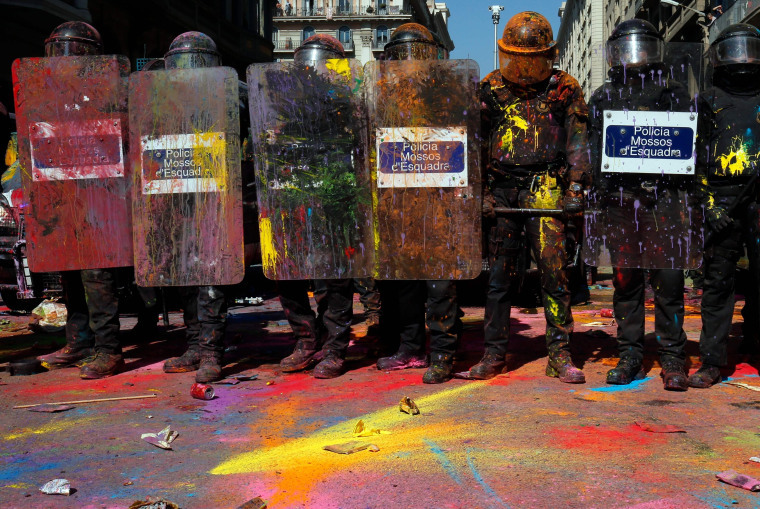 Separatists threw paint at police, covering anti-riot shields, police vans and the pavement in a downtown square in a panoply of bright colors. The protesters also threw projectiles at police. Officers responded with baton strikes to keep them back. Earlier, local Catalan police intervened to form a barrier when a separatist threw purple paint on a man who was part of the march of around 100 people in support of Spanish police. Officers used batons to push back the oncoming separatists and keep apart the opposing groups. "I make a call for calm, this city has always defended that everyone can exercise their rights to free speech," Barcelona mayor Ada Colau told Catalunya Radio. Tensions are running high in Spain's northeastern Catalonia before Monday's anniversary of an illegal referendum on independence held by regional lawmakers. Catalonia's separatist-led government is asking Spain's central authorities to authorize a binding vote on secession. Polls and recent elections show that the region's 7.5 million residents are roughly equally divided by the secession question.